This is a night Griffin has been looking forward to since the first t-ball game ... trophy night! Okay ... so maybe I shouldn't say this but I am going to anyway. When it came time to distribute or "award" the trophies they were just handed out to the kids in the boxes. I'll be honest I was a teeny bit disappointed with this. When Griffin played soccer they made a big deal of calling the kids up and recognizing them with the trophy and we could take a picture. So there ... I said it. Griffin posing with Daddy and his cool t-ball trophy. At home after the game with his trophy ... he's so proud of it. Griffin enjoyed his first t-ball season. It was a good experience all around. He's already asking when he can play again! 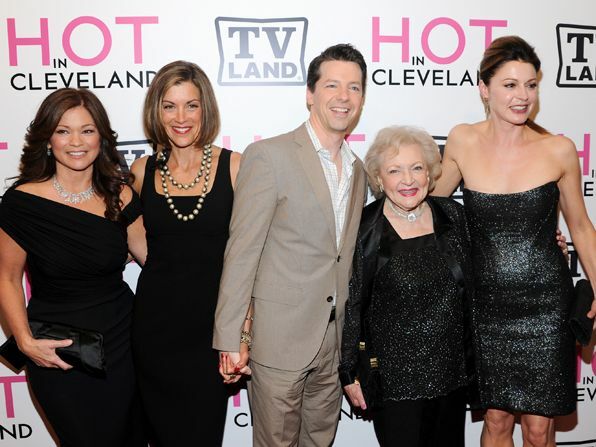 I have a new favorite tv show ... it's called Hot In Cleveland. It's funny ... it's smart ... it's adult comedy. Hot In Cleveland stars Betty White, Valerie Bertinelli, Wendie Malick and Jane Leeves. It's the perfect cast. The guy shown here in the middle is Sean Hayes, he's the producer. Remember him from Will & Grace? It's on the TV Land channel ... it's a must see! If you tune in to watch let me know what you think. The Lake + Good Friends = A Sunny Good Time! We went to Lake Anna with some friends the other day and had a great time! We have been to Lake Anna twice before ... both times in September when it was too cold to swim. This visit in July was a perfect sunny day to swim and have fun! The kids (Griffin, Hannah, Zach, Sara and Sam) in the water together. Getting him to stay still for this picture was tough ... he wanted to play beach ball! Who's that cutie digging in the dirt ... why it's Sam! Hannah & Sara helped Griffin and Sam build this awesome sand castle track so they could run the tractors all around. Really, is there anything better than sharing an ice cream with a friend? We had such a wonderful day ... I hope we can visit again before the summer is over. When we were away on our little mini vacation earlier this month our friends Heidi, Ryan and Evan drove down to spend some time with us. We had not seen them since last summer ... and it was so wonderful to see them. The boys picked right up ... love the ways kids can do that. Evan is taking it easy on the stairs. Griffin and Ryan and doing their best "cowabunga" jumps into the pool. Evan, Heidi, Ryan, Me and Griffin enjoying a little fun in the sun. After swimming in the pool we all went out to dinner to a wonderful BBQ place not too far from the North Carolina line. Then we went back to our hotel room and the boys played for awhile. It was so wonderful seeing our friends ... we miss you so much! Last night I had one of those nights as a parent where I was so proud of my little boy ... I could just burst with joy! This is Griffin's first t-ball season and he's learning to play the game. He's very lucky to have a team of coaches that are patient, kind and are willing to teach our litte ones the game. Sometimes there are distractions on the field for him (such as kicking up the dirt and writing in the sand). However last night it was all about the game for Griffin ... he really payed attention and listened. This is his official team picture ... our little t-ball player. The coach assigned Griffin to first base last night. He listened to their direction about watching the ball, catching the ball once it was thrown to him and then finally getting the ball back to the pitcher. He hit the ball and he's headed to first ... well looky there ... Daddy is the first base coach tonight. What a game ... it was so much fun watching him learn, listen and playing the game! I can't believe I forgot to blog about our super fun 4th of July! Mike was scheduled to be out of town during the 4th and a few days after. So, Griffin and I packed up and went with him! Bouncy houses, face painting, balloons, children's crafts, freebies and a concert ... and it was FREE! Griffin LOVES bouncy houses ... and this slide was his favorite! Do you see this adorable fire boy face? We stood in line for and HOUR and a HALF for that face to shine. He was so happy with this "fire boy" face. After the celebration we went out to dinner and what better way to celebrate American's birthday than with a chocolate cupcake? The fireworks did not begin until 10 pm so we decided to watch them from the hotel parking lot. Mike and Griffin anxiously awaiting the fireworks to begin! And finally ... just a cute shot of our sweet boy "blowing" out the fire from his face. What a wonderful time we had ... thank you Danville for a great celebration!! Country Living ... Oh Deer! Greeeeen Acres ... it's the place to be. Faaaaaaaaarm living it's the life for me. Although we do not live on a farm we do live a wonderful, peaceful country life. We enjoy seeing the wildlife and watching nature work her magic. The previous owner of our house planted a half dozen fruit trees out back. This is a picture of one of the pear trees. Although I consider them unedible because they are super bitter the squirrels and deer LOVE them! I think these are plums. I took this picture when they were still green. They are bright reddish purple right now and apparently they are D.E.L.I.C.I.O.S. to the wild ones. I have actually tasted one of these. They remind me of a large grape with the same taste and texture. See this beautiful girl? She's been visiting quite frequently lately as well as a few other deer. She's so funny to watch. She'll eat the fruit, lick her face and go back for more. She seems to be loving this little fruit buffet we are offering. Growing up in the country is such a joy and I love that Griffin has the opportunity to experience all of this! It's been fun being able to walk outside to do a little splishing and splashing whenever we want to! It's even that much more fun when you do it with good friends! Here we see Zachary, Sam and Griffin enjoying a little fun in the sun and having a bit of a relaxing time on the noodles. And there's sweet Sara enjoying her ride on the "seahorse" of a noodle. We are lucky to have such GREAT friends ... we love the Hall family! This week I plan to share some of the super fun things we have been doing. Seems like time gets away from me and time to blog just hasn't been at the top of the list. But this week it will be! We went to the movie theater last week to see Toy Story 3. This movie was fantastic! It made me laugh. It made me cry. It was a beautiful story about friendship, love and children growing up. On the way home from the movie I had one of those significant "AHA" moments that Oprah often talks about. My boy is growing up. He'll begin kindergarten in just about a month. Our life will change completely. The tears were streaming down my face when I had this realization. Of course I knew the time was coming but watching Toy Story 3 made it a reality. So my goal for the remaining month we have is to have fun, more fun and even more fun!! I have a FUN FRIDAY GIVE-A-WAY over on my Missy Made It! Facebook right now! 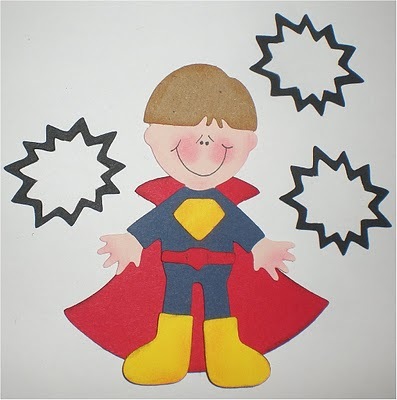 This is the cute Super Hero Paper Piecing I am giving away! If interested visit my Missy Made It! Facebook Page by clicking HERE! My friend Sybil asked me to make some Super Hero Paper Piecings to use on her son Lukka's 2nd Birthday Party invitations. I just had to share them with you! I made the little Super Heroes and she did everything else! She's so creative! She used water colors on the background and made the city scape and moon/star embellishments ... oh so cute! Look at the inside ... I love how she added the yellow "whooshes" to give that super hero feeling to the invitations.